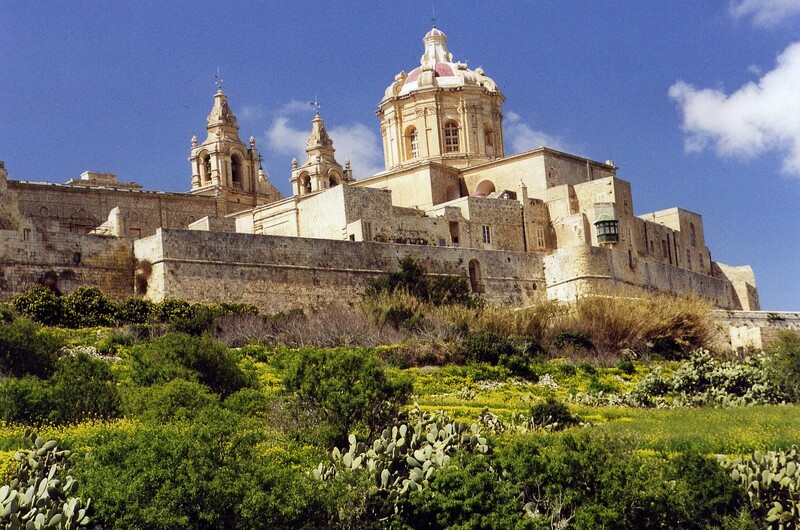 Mdina, Malta's old Capital City! Away from the city of Valletta, and way from the coastal resort towns, the countryside opens up with undulating arable fields where the rich soil farmed in terraced fields seems able to produce abundant crops even in the hottest months. Dominating the centre of the island is the medieval walled city of Medina with its proud cathedral dedicated to St Paul. Perched on a plateau with panoramic views across the island, this site has been the home of various communities over the centuries because, at 150m above the surrounding countryside, it was always considered simple to defend. The settlement has hade a number of names. Then in the 15th century, after the islands had bravely withstood and attack by Saracen forces, Alsonso V of Aragon, who now owned the islands, gave the city an honorific title, Cittá Notabile. The Notable City. Then, after the Great Siege of 1565 when Valletta was built and eclipsed Mdina as it became the capital of Malta, it was renamed Cittá Vecchia – the old city – to distinguish it from the new city. The Maltese, however, steadfastly called it the name it is still called today, Mdina, a corruption of its Arabic name. Bastion walls circling the remarkable medieval hilltop city of Medina were erected by the Knights of the order of St John to offer protection to the city that was then the capital of Malta. Within its Walls are narrow winding streets with terraced limestone houses that are still home to many as well as a collection of churches and convents that form part of islands historic religious heritage. The superb Cathedral dedicated to St Paul was built between 1697 and 1702 to replace a Norman Cathedral that was destroyed in 1693 by an earthquake that shattered the islands calm. Tradition says the cathedral is on the site of the house where Pubilus, the governor of the island, received St Paul after he was shipwrecked on Malta and who, after his conversion to Christianity by the apostle, became the first bishop of Malta. In a seclude square, a 17th the century palazzo that forms part of Mdina´s towering walls was transformed in 1999 into the luxurious Xara Palace Hotel that features prominently in the prestigious Relais & Chateaux collection as on of the World´s most beautiful hotels and restaurants. The Xara Palace is a boutique hotel with the terraces of its fine dining restaurant, the de Mondion, offering a superb panoramic view of Malta looking towards Valetta and the south. In the piazza is their trattoria, a popular informal meeting place.